Beagle collected a helper in Wednesday's 7-4 win over the Senators. 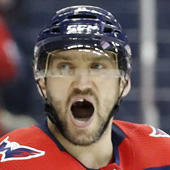 Beagle's found a bit of a groove with a goal and two helpers in his last six appearances, adding 11 hits in that span. For the season, the fourth-line center has 11 points in 49 games in a somewhat disappointing first season in Vancouver. It's safe to avoid the pivot for fantasy purposes.